Robocalls, those computer-generated shysters, are making some people stop answering the phone altogether. The rest of us trust unknown calls about as much as truck stop sushi. By several estimates, Americans got more than 5.2 billion automated calls in March – a record of about 16 for every man, woman and child. It’s happening because the internet made it incredibly cheap and easy to place thousands of calls in an instant. But we don’t have to just bury our heads in the spam and take it. While lawmakers debate what to do about the roboscourge, engineers have cooked up some clever ways to make bots work for us, not against us. Verizon just began offering free spam-fighting tech like AT&T and T-Mobile, if you sign up. The right app or service on your phone can make it safer to say hello again – or even exact revenge. My test lasers in on one important question: Who was first at identifying the bad guys? I discovered no service could flag more than two-thirds of the calls on my list, in part because so many robocalls spoof their identities. Those are the callers that look conspicuously similar to your number, or copy the caller ID of some poor soul who gets lots of angry return calls. In a robocall deathmatch, speed matters. And one free app was, on average, faster at adding bad guys to its blacklist. It comes down to how much effort you want to put into battling robocalls, and how much personal information you’re willing to share to make it happen. Just adding numbers to your phone’s individual block list won’t get you very far, but there are a few simple steps everyone could benefit from. Here’s my recommended plan of attack. It won’t help much, but it only takes 30 seconds so why not? The list, kept by the Federal Trade Commission, tells legitimate telemarketers not to bother you – the equivalent of a “no trespassing” sign on your lawn. Bonus: It also registers with the government that you care about this issue. It’s free to register at donotcall.gov. Phone companies have finally realized that stopping robocalls is an essential part of what we pay them for. You may have heard that recently the biggest carriers pledged to support new network technology with – STIR/SHAKEN – that will help identify the true origin of calls. That’s a good thing to help stop all those spoofed calls, but there’s still a lot to work out before it might make a noticeable difference. Meanwhile, everyone should take advantage of tech the carriers offer to identify and block certain robocalls. AT&T, T-Mobile and Verizon offer free services that monitor network activity and crowdsourced reports to block suspected fraudulent calls. The carriers outsource these services to Hiya, First Orion and TNS, respectively. Don’t worry: they cross-check your contacts list to make sure they don’t block someone legitimate. One caveat: If your company pays for your phone service, it might have to authorize turning on some of these services. – AT&T: AT&T Call Protect. The free level of service will label suspected spammers and gives you the option to automatically block calls that are a fraud risk. Unfortunately, if you also want to automatically block nuisances like spam, political calls and telemarketers, you have to pay $4 per month, which also comes with access to AT&T’s mobile security service. – Verizon: Verizon Call Filter. 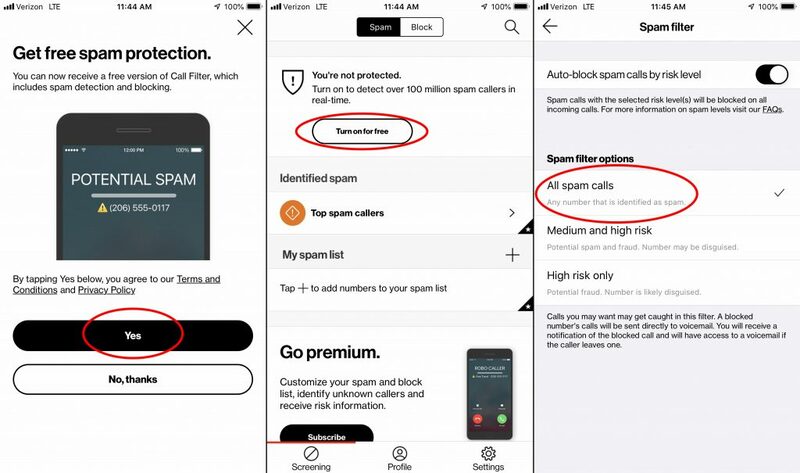 As of last week, Verizon stopped charging for basic service, which labels suspected robocalls and gives you three options based on risk level for how many to block. If you pay $3 per month, you’ll also get caller ID. – T-Mobile: Most T-Mobile customers already have the company’s Scam ID and Scam Block service turned on, with no need to download an additional app. If you pay $4 per month, you’ll get better caller ID and the ability to send more kinds of calls straight to voicemail. In my test, the carrier services were slower at adding spammers to blacklists than some independent apps – and paying for their premium versions won’t make them faster. In everyday use, these services take advantage of algorithms that might have stopped spoof numbers my test didn’t pick up. Verizon’s service provider TNS and AT&T’s provider Hiya identified nearly the same number of robocalls, though Hiya did so, on average, a bit faster. (T-Mobile’s provider First Orion declined to participate.) Just as important: Both let the legitimate calls through. Independent apps offer a few tricks of their own, but they’re not all effective and might be after the personal data in your phone. Into my bot battle, I threw four popular apps: Nomorobo, RoboKiller, Truecaller and YouMail. I also spoke with the companies behind them about how they make money and handle our privacy. I recommend starting with the free YouMail, which won my robocall speed test. The main reason it’s faster is that it has data the carrier-provided services don’t: the contents of your voicemail. YouMail replaces your phone’s existing voicemail service, and it uses software to identify when robocallers leave messages – like Shazam for spam. That helps it quickly crowdsource the identity of new robocallers and block them from other phones. If YouMail, which has about 10 million registered users, sees a scam rotating through lots of different spoofed numbers, it knows not to block those numbers that belong to legitimate callers for all its users. A coming update will also let you automatically block spoof calls designed to look like they’re coming from neighbors. And my favorite part: YouMail tries to trick known robocallers into taking you off their lists by playing them the beep-beep-beep sound of a dead line. I wouldn’t blame you for being hesitant about handing over so much data, including (on Android phones) the details of every call that comes in. You’re required to use the YouMail to listen to your messages, but it does helpfully transcribe them, make them accessible on the web and offer fun outgoing message options. YouMail says it makes money through selling a premium voicemail service for businesses and through advertising, but over its 12-year history has also run an identity-verification data service. The company told me it’s ending its data business and won’t sell user data or share it with others unless it’s part of an effort to stop robocalls. If you don’t want to give up your voicemail, the most-effective option is Truecaller, which replaces your phone’s main call app and crowdsources spam numbers from some 300 million users worldwide (including 10 million in the U.S.). But it wasn’t my favorite, because you have to pay $3 per month to automatically block top spammers, and it stuffs in lots of functions unrelated to robocalling. The simplest, $2 per month Nomorobo, is one of the first robocall blockers on the market with a popular service for home lines. On your smartphone, Nomorobo doesn’t sell your data or monkey around with your voicemail or calling apps, and it is smart about blocking spoofed calls that appear to be from neighbors. But I also found it was the slowest to add my test’s robocalls to its blacklist. For some, dark times call for dark measures. The $4 per month RoboKiller, which ranked second in my speed test, also takes over and fingerprints your voicemails but adds a clever twist: “answer bots.” They’re voicemail messages that try to keep robots and human telemarketers on the line, listening to nonsense. Another service, called Jolly Roger, doesn’t sell itself as a robocall blocker but takes this auto-generated annoyance idea a step further by actively trying to game the spammers’ systems, such as when to press 1 to speak to a human. It calls this tech “artificial stupidity.” It costs $11.88 per year. It’s possible you’re better off not engaging with a robocall in the hopes the dialer with decide the line is dead. And it’s also not clear how much these actually cost the people placing robocalls. But any time robocallers spend with your bot might be minutes they’re not calling someone else, so you can think of it as community service. I expect we’ll see more call software that works like this. Google’s Pixel phones last year added a button to have a robot assistant screen calls for you. Even if you’re not interested in revenge, good bots can play a role in combating bad ones.